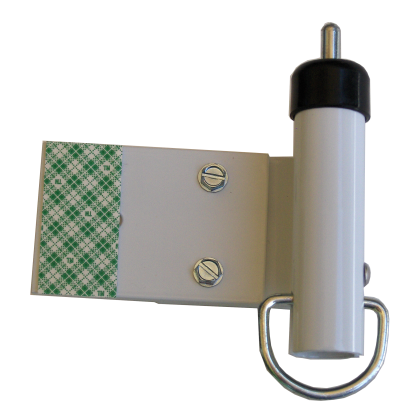 Save Your RV Awning with an RV Awning Travel Lock! Install RV Awning Travel Lock! Our awning blew off while traveling about a year back. Insurance replaced it but we were blessed that we didn't hurt anyone or damage our coach or car. The awning makers should be required to put one of your units on each coach. Only one RV Awning Travel Lock is required on a patio awning. Strapping the arms together DOES NOT prevent a patio awning from unfurling. RV Awning Travel Locks for Carefree and LCI power awnings are now available! Locks for Carefree window and door awnings are also available. Please contact the manufacturer, Loess Hills Innovations, at goldenwgf@aol.com or 712 310-7188 for information, prices, and to order. There's a very interesting thread in the forum's section of irv2.com. If you've wondered about your awning coming unfurled, you might want to read at least some of that thread. Just about any patio awning can come unfurled. 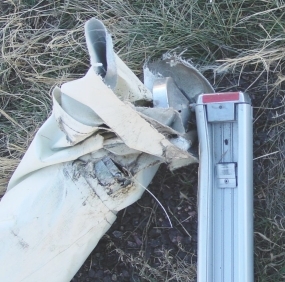 Unfurling can be prevented by preventing the awning roller tube from rotating. Strapping the arms together will NOT prevent unfurling. You DO NOT want it to happen to you. Ever. We had the "awning unfurling experience" going through the Kentucky mountains last week. Unbelievable, scary, and something I would never have thought could happen. Today I started looking online for information on this topic and found your site and video. After reviewing several blogs, posts, forums etc. I decided that your product is definitely superior in every way to the DIY homemade projects. I have just placed my order for a "Model A" for my A&E 8500 . . .
. . . Once installed, I will take some photos and send you an update. Thanks in advance for your assistance and I look forward to many more miles of "Safe Travels" once installed. This short video comments on statements made on a popular RV forum. If you've traveled extensively with your RV, chances are you have either lost an awning while driving down the road or know someone who has. It has happened to me. The cost to repair such an event can easily be several hundred dollars—and that's if you're lucky! And that doesn't even address the inconvenience, delay, and frustration caused by the sudden departure of parts of your awning from your coach. I just wanted to let you know I received my awning lock. That was very quick shipment. The awning lock is beautifully designed and manufactured and very easy to install. I spent about an hour installing mine, just because I wanted to be sure I did it correctly. After the first one, I could probably install another one in 15 to 20 minutes. Your product operates well and is worth every penny. What Happens to RV Awnings? While driving down the highway, the awning fabric billows upward. This is most likely to happen while at cruise speed on a day with strong gusts of wind. When the awning billows, it simply becomes a huge sail with lots of power. That power usually rips the fabric and often bends or breaks much of the hardware which attaches the awning to the coach. Often, awning fittings are literally ripped from the coach, damaging the coach as well as awning fittings, rafters, and the roller. According to The Greatest Myth in RVing, this disastrous event is triggered by the support arms falling open. Not True! This can happen even if the arms are secured so they can not "fall open." It is triggered by air action which pulls the canopy fabric upward. This can put tremendous force on the roller, force which the manufacturer's built-in brake can not hold. The awning roller rotates and lets more of the awning fabric unroll. This creates an even larger "sail." This puts ever greater forces upon the RV awning components and something has to give! 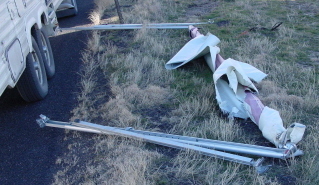 Usually the awning fabric tears and the awning parts are ripped from the coach. Once the destructive process begins, it will all be over in a few seconds. Except dealing with the aftermath, that is. If one is very fortunate, only modest additional damage is done to the coach itself or to other vehicles. Even then, the expense to return to normal is several hundred dollars, a frustrating delay, and a mess to clean up. And remember, that's if you're lucky! Why Do RV Awnings Blow Off? Each awning manufacturer builds a "catch," or brake, into the awning roller. It is supposed to prevent the awning fabric from unwinding except when one is extending the awning on purpose. These catches occasionally fail to do their job, even on relatively new awnings. (No one is immune!) The result is that the RVer has an expensive mess on their hands. ... We were bringing our Kountry Star MH home from Newmar after having them put on a new rubber roof. We got into storms with 60mph wind gusts. The awning blew out 3 times before we finally parked and waited out the storms. The last 2 times I had taped the arms together with duct tape and it still blew out. Believe it or not after the last time it rolled itsself back up and I taped the roller shield (9000 awning) to the side of the coach so it couldn't unroll again. Unfortunately the awning fabric tore on the last blow out. I am definitely adding the Awning Lock as soon as I am sure of the right model and fit. Purchase and install an after-market awning lock on your RV awning—one which will actually lock the roller tube in place so that it can not rotate! This will greatly reduce the chance that your awning will be inadvertently lost due to a wind gust while traveling. The RV Awning Travel Lock offered here is simple to install; you can probably do it yourself in about an hour. It'll fit just about any manually operated A & E or Carefree awning manufactured since 1985. It may also fit other awnings, but a complete list isn't available. The lock will come to you completely assembled, as shown at the left. (Click the picture to enlarge it.) The three self-tapping, self-threading, screws required to attach it to your existing awning are included, as are two pop rivets which might or might not be needed. And there's a full sheet, both sides, of detailed instructions. The detailed, tedious, work of researching the problem and coming up with a solution has already been done. The product has been produced, assembled, and packaged and great instructions provided. The hard part has been done; all that remains is for you to buy and install the lock for protection against an unpleasant event which can definitely ruin your day, and possibly your vacation. Is it worth about fifty bucks to be practically assured that you'll never lose an awning? Order Today!
. . . At any rate, thanks for your great customer service and, most importantly, your patience! Now that I see it, I can see that installation is a piece of cake. I just didn't want to make a stupid and irreversible mistake. and a few days later, this . . . Installed the lock today in less than 45 minutes, even with being very careful and double-checking everything. It was ridiculously easy, once you understand what you're supposed to do. . . .
Each awning requires only one RV Awning Travel Lock. The RV Awning Travel Lock does not mount to the coach itself. The Model A mounts on the bottom (or rear) side of the awning rafter with three screws, which are supplied with the lock. This is used on many awnings. 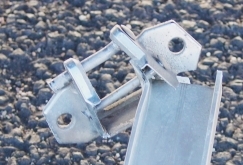 The Model B mounts on the side of the awning arm of certain models of awnings. A "Model B" RV Awning Travel Lock is available for electrically-operated A&E WeatherPro and A&E Power Awning (shim required) awnings. This is also the model to use on an A&E OneStep and TwoStep awnings. It is also used on some other manually-operated awnings. To unlock the RV Awning Travel Lock, insert the hook of your awning wand into the ring, pull it toward you about 3/4", then rotate it 90 degrees. To lock it, do just the reverse. We ship to Canada and Australia and already have several customers there. Same price but different shipping and handling charges—in US dollars, of course. 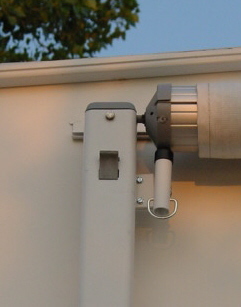 The RV Awning Travel Lock keeps the roller tube from rotating. Velcro straps and other devices which hold the arms together do absolutely nothing to keep the roller tube from rotating and therefore are totally ineffective in preventing loss of your awning due to a gust of wind from the side. The metal sheath over some awnings (A&E 9000, for example) is not intended to keep the awning from unfurling and does not do so. ...thanks for this great awning pin. I am going to install it this weekend. I am impressed with how sturdy it is. Thanks Keith and you have a great day. If you spend an hour or two searching the 'net, you can find several devices offered which are intended to solve the problem discussed above. Some are a bit inconvenient to engage/disengage when you go to lock/unlock your awning. Others detract from the appearance of your coach. And at least one even attaches to the body of the coach! Few are patented. If you do spend the time and research the solutions, chances are good that you'll end up back at this page so you might want to Bookmark this page right now. The awning lock we offer was invented and is produced by an RVer with decades of RVing experience. He researched the mechanics of RV awnings and came up with a simple, inexpensive, and, most importantly, effective solution to what can be a very expensive problem for an RVer. The result is the RV Awning Travel Lock, a patented product offered here. The RV Awning Travel Lock is attractive and does not detract from the coach's appearance. In fact, it looks as if it was part of the coach and, we feel, should have been! It can be engaged or disengaged in a few seconds, using your normal awning wand. It's effectiveness comes from the way it secures the roller. It locks the roller from rotating by inserting a steel rod about 3/8" into the roller tube and its end cap. Truly a positive, mechanically sound, method of preventing rotation and the accompanying damage to your property. Reduce the risk of losing your awning by ordering and installing an RV Awning Travel Lock now, before your next trip! Which Model of RV Awning Travel Lock Should I Order? Pictures of several awnings are shown to help determine which RV Awning Travel Lock to order on this page: Which Model? RV Awning Travel Locks are usually in stock. Orders are almost always processed within 24 hours of receipt. The price is $39.95 for each lock plus $4.50 shipping and handling for each order (each order, not each lock) in the U.S.
For shipments to Canada, it is $11.00 for one or two locks. To the United Kingdom, it is $11.30 for one or two locks, $20.00 for three or more. For some countries, the Shipping and Handling charge will automatically be shown during the checkout process. If you have questions about the lock, your application, or ordering, please feel free to email me or phone me. There are two convenient ways to order: online or by mail. (Ordering by phone and paying with a credit card isn't an option because the credit card charges are huge.) Choose the one most convenient for you. You can order directly from this site, via PayPal, and pay with a credit card or your PayPal account. (You do not need to have a PayPal account to pay using your credit card via PayPal.) Once the shopping cart comes up, you can change the quantity if you want to order more than one RV Awning Travel Lock. The form will take care of all the math. Iowa residents note: The Iowa Sales Tax will be calculated at 7%. If the tax is less than that at your delivery point, please send me a message with the actual tax rate. The difference will be refunded to you. Select the model you wish to order from the drop-down menu below. Then click the "Add to Cart" button. If you prefer, mail a check or money order in US Dollars to the address below. The amount is $39.95 for each lock plus $4.50 to cover shipping and handling expenses for each order shipped within the US. For other countries, see the first paragraph in this section. Iowa residents: Add the sales tax applicable at your ship-to address. This will be between 5% and 7%. Be sure to specify whether you want a Model A, a Model B w/TSWP Adapter , or a Model B w/TSWP Adapter + Spacer. If you have questions about the RV Awning Travel Lock, please contact me. Thank you for the prompt service. I received the awning lock today. I will installing it shortly. I ordered other items from different venders prior to your order. I have not received any of those items yet. Thanks again for your prompt service. Second, when you order a Model A RV Awning Travel Lock from this site you'll receive an Additional Installation Information sheet which includes seven photos which supplement the already-great instructions. Some who have ordered from awninglock.com have commented that these were very helpful. Third, I'll be glad to answer any questions via e-mail or phone. Appreciate the awesome service, waiting for a dry day to install the lock. I am looking forward to receiving the awning lock. It will really put my mind at ease during travel. Thank you very much to take the time to both respond to my email and in speaking with me on the phone.